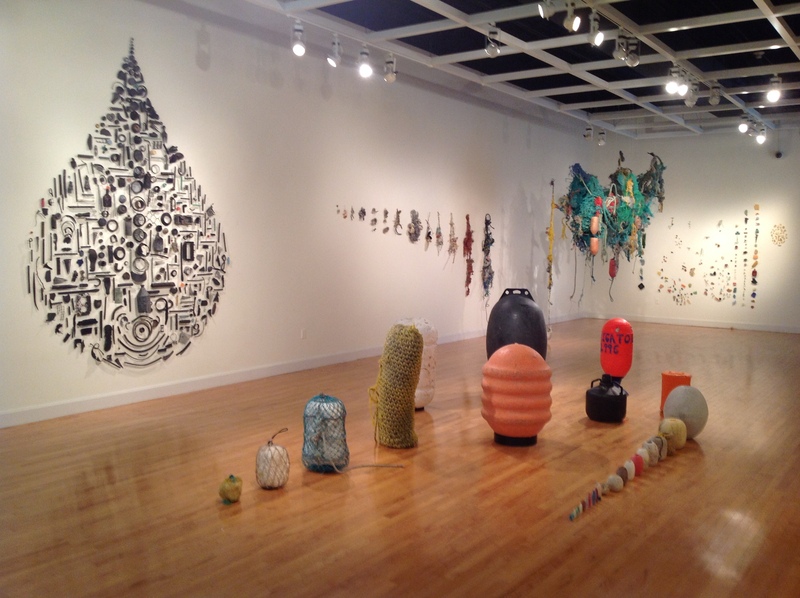 Bitter Pills (floor piece), 2014, vagrant plastic floats and buoys recovered from remote Alaska beaches. The large black object is the float for oyster aquaculture of the Japanese pearl industry. It was found on Katmai National Park beach near where grizzly bears (Alaskan brown bears) forage for clams in the mud flats. It is debris that traveled across the Pacific in the 2011 Japanese tsunami and Fukushima nuclear disaster. The other floats represent the size and scale of the massive fishing industry plowing the Pacific Ocean. Currents transport these lost floating objects around the world. This work contains the entire contents of the first plastic intervention I performed in 2006 on the South Point of Hawaii that became the genesis of the Drifters Project. Drift Lines (back left wall), 2014, found ocean-made rope and net balls, dimension variable. Ocean-made collages of net, rope and other materials created as the engine of the sea sorts, gathers, collects and tangles the drift nets and other fishing gear in an attempt to disgorge it. Retrieved from beaches in Gulf of Mexico, Alaska, Hawaii, and Greece.